Going for a long walk can be one of the best ways to spend your time. Not only is it a great source of exercise but is also the ideal time to bond with friends and family members. If you’re a nature lover then this should be right down your alley; hiking gives you the opportunity to take in everything that’s around you and relax in the wild. What you take with you on your trip will also be very important, if you’re only going for a day hike, and not planning to stay overnight then you won’t need to take a massive backpack with you. 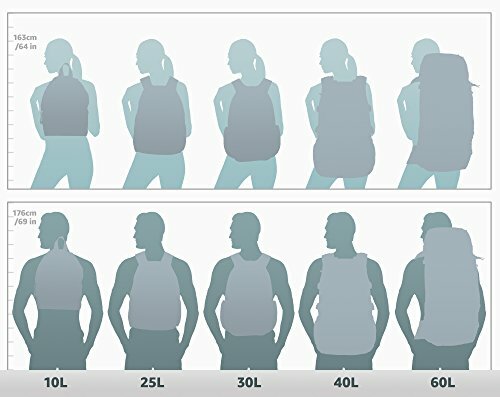 Daypacks are measured on a number of different factors, the most obvious of these being its size (Normally in Litres). Certain features and capabilities will set bags apart, for example, some are shower proof some have extra pockets, more space on the inside/outside and much more! Before we start our list of the best small backpacks for day long hiking trips we will give you a quick buying guide, this will help you decide which features suit you best in Backpacks. What should I look out for in a daypack? Comfort is one of if not the main factor when you are picking a small daypack, especially when it will be used all day long, Nobody wants to haul an irritating/uncomfortable backpack around with them all day. There are many different things which will affect how comfortable a Bag is, one of the main things being the build material and padding used. Most daypacks come with breathable material that allows heat to escape from your back instead of keeping it all trapped, making you hot and sweaty. The Shoulder straps are also surprisingly important to make sure you pick a daypack with padded and durable straps that will last many years into the future! Durability obviously when you are looking at all of the options available you will want to pick one which will be taken on multiple trips. The materials used and build quality are the main factors when working out how durable a daypack is. But all you will have to do is read a review to find out what people think of a product. How long it will last etc. Weatherproof, another really important part of a bag is the way it defends against the weather. Which features you look out for in this case may depend on where you live, for example, if you live in a very wet area you will probably want a big which won’t let the rain seep through. In most cases, daypacks are only weatherproof, not fully waterproof which pretty much means they will be fine as long as you don’t just leave them in the rain for hours on end. But if you are looking for backpack that you can literally drop into the sea and everything inside will stay dry then check this 100% waterproof backpack from DryTide. If you live in a hot area make sure you pick a Bag which breathable and will let fresh air get to your back. There is nothing worse than being sticky and Sweaty whilst trying to navigate your way over tricky terrain. Storage Space, although you will only be using this bag for short walks you will still need quite a bit of storage space. After all, that is the whole point of taking a daypack with you. Make sure you pick one which has more than enough room for everything you want to take on your journey. It never hurts to have a bit more room than you originally thought was needed. Even if you just end up filling it with extra snacks. One thing we would recommend to look out for in a daypack is Bungees/secure pockets on the outside of the daypack, these are great for storing a drink or hiking camera so you can easily grab them while on the go! If you are looking to power smart devices, you might want to check out our guide to smart backpacks. What should I do before buying a daypack? Well first off we would recommend measuring your Torso so that you know what size will be right for you if you are a bigger person we’d say it’s a given that you will want a bigger daypack. Take into consideration any personality traits, for example, you may simply have broad shoulders, allergic to certain materials etc. If possible you will probably want to pick a few different daypacks that you like the look of and go to your local outdoor shop to try them on. Even if you don’t purchase them there and then at least you will have an idea of its size, weight and much more! Obviously, your budget will have a massive effect on what daypack you can buy. But don’t ever let the price of an item put you off. Just because a Bag is cheaper, that doesn’t make it worse. Make sure you read a couple of reviews and pick the best option within your price range. Plus everybody has different needs so what you look for in a bag may not even be included in the most expensive version! With there being literally hundreds of options out there you will have to search wide and far to find your overall favorite. But there should definitely be a daypack out there for everyone! Going on a day long hike is an invigorating and amazing experience which will reconnect you with nature and be a great source of exercise. Maybe you have a friend or family member who always complains about being too hungry/thirsty throughout. If one of you takes a small daypack this problem will be easily avoided. Below we have found what we believe are the best daypacks for a day long hiking trip. We have taken all factors into consideration and read multiple reviews on each product; so that you don’t have to! Everything we’ve learned about each product has been compiled into one easy to read and informative review. Hopefully, after reading this buying guide you know exactly what to look out for in each daypack. Anyway, let’s get on with it! 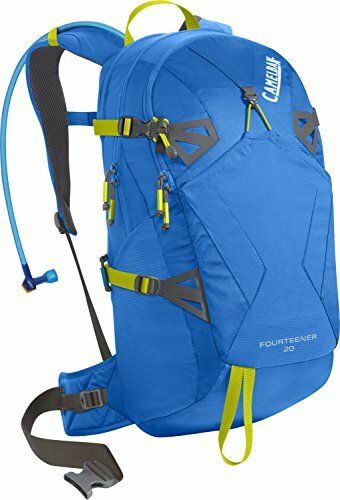 If you’re planning to go on a Day trip/walk then the Camelbak Fourteener is one of the best options on the market today. They have really tried to add features that people will use and appreciate; it will be hard for you to find a better Backpack than this! Below we will go over some of the key features, pro’s, cons and much more! Total Capacity- 1342 Cubic Inches / 22Litres + Bladder. Overall Dimensions- 22 x 12.2 x12.60 inches / 56 x 31 32 centimetres. Suggested Maximum Weight Capacity- 25-27.5 pounds (lbs). The added water reservoir and hydrations system are one of the best features you could wish for in a backpack. This way before setting off you will be able to fill up the 3 Litre reservoir and stay hydrated for the whole trip. With the big bite valve, you won’t even have to stop walking to have a drink! You can easily refill the bladder at any time and it fits perfectly in the backpack. More than enough storage room, especially when you take into consideration the fact you won’t need to take any drinks with you! There are added pockets on the outside, a specific storage space for your Sunglasses. Specific storage space for your water, Places you can attach Tools etc. Really comfortable, if you want a comfortable backpack which you will forget is even there then look no further. The CamelBak has added extra padding in many different parts of the Bag from the lower back panels to NV panels. Limited water resistance, this is far from waterproof but doesn’t claim to be either. If you live in an area where the weather is not the greatest then you may want to look at some of the other options. Price, although this is far from the most expensive backpack on our list, this is still quite expensive at around $100 when compared to some other Backpacks. If you are looking a dedicated hydration bladder backpack try here. A great backpack for anyone who wants a lot of storage space, comfort and doesn’t isn’t too bothered about the rain finding a way in. It will be really difficult to find a better bag when it comes to storage, and CamelBak has really impressed us by including a water hydration system within this backpack. This means if you enjoy running, going on a bike ride or pretty much any form of exercise you could simply put this on and take then have the ability to drink whilst on the go. Again that does mean the bag is slightly heavier than some of the other options, but not overly weighty. 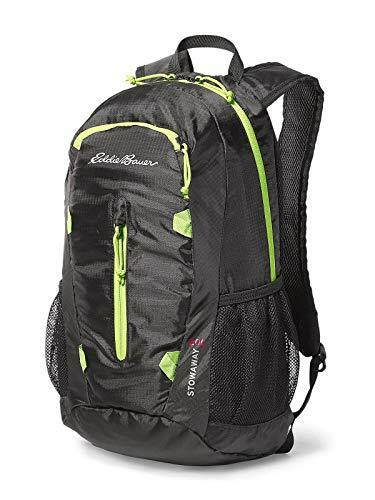 One of the most affordable options online is the Eddie Bauer Daypack, this is truly impressive and comes in at an amazing $28 on the Amazon marketplace. There are 3 different colors available Black, Brown and True blue. All of which look really nice and Eddie Bauer have created an amazing value for money backpack here. Which in our opinion is the best option when it comes to purchasing a ‘cheap’ bag for them day-long hiking journeys! Storage space, the Eddie Bauer team have clearly put a lot of thought into how they can get the most storage space out of this bag. Not only are there 2 exterior pockets but the added D rings give you the ability to add a bottle of water, tools or anything else you may want to take on your walk! Price, seen as this is the cheapest day pack on our list the price is undoubtedly one of the biggest pros. Coming in at an amazing $18 you will be getting great value for your money if you decide to go with the Eddie Bauer. The shoulder pads are not only padded but also breathable, which means at no point throughout your walk will your shoulders become uncomfortable or too hot. Secure, most of the Storage spaces on this bag come with zips, Velcro’s and other safety features. There is nothing worse than getting to the end of a hike to realize that you dropped your water bottle, food, tools or anything else. Not the most durable Backpack out there. When you compare this to some of the $75+ models it probably won’t last anywhere near as long. Although that doesn’t go to say you won’t have this for years to come. A lot of this simply depends on how often you plan to use the product. The water repellent finish is good, but not perfect. This is one of the best ‘cheap’ daypacks on the market today and certainly, shouldn’t be overlooked by consumers. It comes with some impressive features and much more storage than we expected for a backpack in this price range! We hope that you decide to give the Eddie Bauer a second look. It will be really hard to find a product that is not only on the same level quality wise but also one which is waterproof and has clearly thought about adding features that the customer will appreciate and use. Osprey is one of the biggest names in the hiking industry and prides themselves on making high-quality and good value for money products. The Stratos 24 certainly doesn’t let us down and has to be rated as one of the greatest daysacks out there. Although it will cost consumers a massive $125 which is more than 4 times the cost of the Eddie Bauer we reviewed above, we can see where the extra costs came from. There are some amazing features that have been implemented into this fantastic backpack and if you take your hiking journeys seriously then this bag could be the perfect choice for you! -Mesh, Stretch pockets on either side. -Stow on the go Trekking Pole attachment. Not only Does the Osprey already have an impressive amount of storage space, but there are also a couple of external pockets which allow you to store any extra items you may need. They have thought about additional trekking essentials that you are likely to take with you. They’ve included a slot for a hydration bladder which means you will be able to stay hydrated without even slowing in speed and there is also a very effective on the go trekking pole attachment for the more serious walkers. The back is completely breathable as are the shoulder straps, that means you should never get too hot or sweaty throughout your Hike. This proves that Osprey has really thought about the design and how it will benefit users. Price, if you’re not on a huge budget than the $125 price tag may put you off, although there are a lot of features and other factors that make it this expensive; it may just be out of your price range! 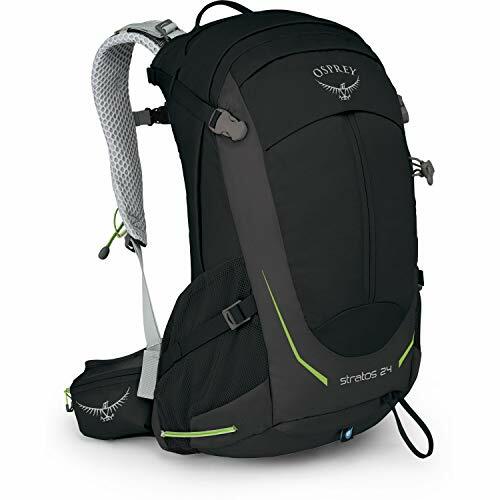 What has to be one of the best daypacks out there Osprey have done a great job of creating a top of the line option for people who take their walking seriously. Although it does come with a hefty price tag it is certainly justified! Unique and amazing features are dotted around this Bag and there’s no doubt that this would soon become your go to equipment organizer when going on day long hikes. There is no doubt that this backpack will still look immaculate and be your best friend in a couple of years, whereas some of the cheaper options would have completely fallen apart. If you take your walks seriously and want a high-quality, durable Backpack then this is one of if not the best option out there. Tool loops. Hydration ports. Internal hydration hanger. Large stretch side pockets. Stretch mesh front pocket. Rolltop closure. Extended overflow. Padded rolling stay. Lightweight, many people don’t want to be hauling around lots of weight and if the bag itself weighs a lot then that could affect the amount of gear they can actually take on their journey. Padded shoulder straps mean that the bad is pretty nice on your shoulders, although there are more comfortable options out there they have tried to make this backpack; or at least the shoulder straps comfy. Simple yet attractive design, obviously a lot of this will be left down to personal preference but we really liked the look of this backpack. This backpack has loads of straps on the outside, this is great for attaching any extra items that you’d like to able to gain quick access to. Certainly not the comfiest Backpack out there, if you spend a lot of time aligning the items you are putting inside then it won’t be too bad, and the shoulder straps are pretty nice. But you will still be disappointed by the overall feel of this Backpack. Not very easy to get into the main compartment once it has been closed. Although this is far from the greatest rucksack available, it has some very impressive features and a unique design, which alone could attract lots of customers. There are two different color schemes available, they are Brilliant Blue/Moonmist and Tiger/Java. Both of which will look great on this Nylon Backpack. Costing users around $120 and getting an average rating of 4.8 on Amazon this is a Daypack that will look very appealing. This is the last product on our list, however, that doesn’t mean it’s the worst, in fact, this is one of the best day packs on the market today and shouldn’t be underestimated. It is highly rated In most reviews and comes in at around $90, which is one of the cheaper products we’ve reviewed. There are four different color schemes available and these are Black/Granite, Black/Titan, Fire/Arctic and Petrol/Arctic. All of these look incredibly nice and there’s definitely going to be one that you like! -Fully Breathable Back and Shoulder Straps. -Re-enforced pull loops on zippers. Extremely lightweight, when you compare this Backpack to some of the others that we’ve reviewed it is extremely lightweight. If you are worried about your day pack being too heavy then this is one of the best options to eliminate that fear. Durable, although there are some more trustworthy bags when it comes to durability Deuter have clearly put a lot of thought into making this bag as strong as possible. They’ve used a reinforced base and multiple materials in the construction of this fantastic Backpack! Price, to say this bag comes with a lifetime guarantee and has some useful features it comes in at a good price. Costing consumers only $80 the Deuter Speed Lite 20 should definitely be one of the options you take a look at if you’re not on a massive budget. The back and Shoulder straps are fully breathable, this is great news for anybody who takes their walking seriously and doesn’t want their back and shoulders to become hot and sweaty after a short journey. It was pretty hard for us to find any negatives surrounding this Daypack. It could be slightly cheaper but other than that it is one of the best all round backpacks currently on the market. Although Theresa slot for a hydration bladder, you will have to purchase your own as one does not come with the Backpack. The last Backpack on our list is probably one of if not the best which we have included so make sure you give this one a second look. There are lots of features which you, the user will appreciate and more than enough storage space for everything you’ll need on a day long hike. If you’re a more serious walker then this bag could be ideal, however, there are also some other high-quality options on the market that offer slightly more. Deuter has always done a great job in the customer service department also so if you do happen you have any issues with the bag when it’s still under warranty don’t worry about getting your replacement! What has to be rated as one of if not the best value for money backpack out there the REI Co-Op Flash is an unbelievable bag. Plus it’s one that won’t leave your wallet feeling lonely. Costing consumers only $40 and coming with some impressive abilities this is one that shouldn’t be overlooked. Many people automatically count out the cheaper products but as we said in our buying guide, sometimes they may be better than the more expensive ones. Carry on reading to find out more about the REI Co-Op Flash. Really lightweight, there isn’t much to this Backpack which means it is really light. When compared to some of the other options it is less than half of the weight, and that’s won’t affect the durability of the product, fortunately! Price, because this is one of the cheapest in our list of the best Backpacks for day long walking trips the price has to be seen as a positive. If you’re not on a massive budget but refuse to give to accept a low-quality Backpack then it will be difficult to find a one better than the REI. Although this bag doesn’t come with a water reservoir there is a slot for one if you already have your own, or that is something that would benefit you throughout your walk. The REI team have clearly put a lot of thought into the design of this Bag and have done everything they can to keep the cost down! There isn’t as much storage space on the inside or outside of this bag when you compare it to some other backpacks. There are only 2 pockets on the whole bag, and even they aren’t very large. 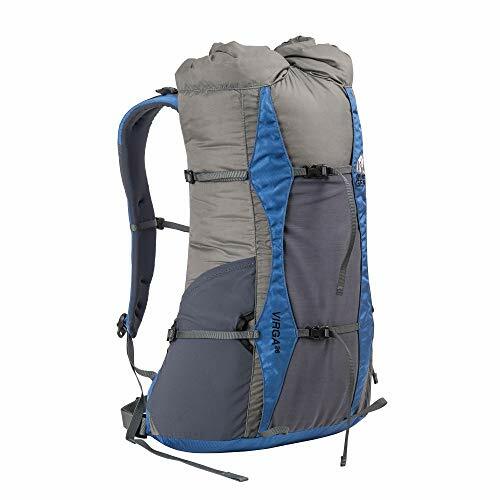 No air circulation in the back area which means your back may get a little sweaty, however, because this backpack doesn’t have the ability to carry massive amounts in weight you this issue shouldn’t be too bad. Nowhere near as much padding as there is on other bags, none on the shoulder straps, back panels or most other areas of the Rucksack. Although it may look as if there are a couple of cons which might put you off of this bag, it really isn’t that bad. When you take the price tag into consideration this is still an exceptionally good product. If you have a low budget good luck trying to find a better Daysack than the REI Co-Op. It still has some really impressive features as well as the ability to store a water reservoir and is extremely light! Well, that brings an end to our list of the best small Backpacks for day-long Hiking trips, we hope that you have found a Bag that suits you and will soon become one of your best friends whilst navigating through the wild. Whether this is your first backpack or simply a replacement there are hundreds of great options and it can be a really difficult task to pick between them. If you are struggling with that decision then we would recommend that you read our buying guide (if you haven’t already)! This way you know exactly what to look out for when choosing a Daypack. Anyway thank you for reading and you are having trouble picking any other equipment for your journey then make sure you check out some of our other pieces! See you again soon and more importantly have a fun time in the wild! Great and informative article. Thanks for your article. I love my osprey pack a lot. It does such a good job. Thanks for sharing! I really liked the way you have explained the daypacks, in your What should I look out for in a daypack? Thanks for all the information.